What I did know was that I couldn’t afford to panic and waste my waning energy. I did the only thing I knew to do. I told myself: “Step with the right foot. Step with the left foot.” This kept me going until I reached a rest stop where I fell backwards and discovered I could not get up without the help of a kind hiker. He noticed that blood, dripping from my arm, was bleeding through my shirt. My hiking friend helped me bandage my arm. Fear enveloped me. How would I find the energy to finish the hike? I didn’t want to admit I was in trouble, but my friend knew something was wrong. She told me I was not only leaning back, I was also tilted to the left side. She suggested we sit and rest in the shade and offered me her salty trail mix. I ate some, trying to pretend that I was fine, forcing myself to ignore my anxiety. When it was time to start hiking again, I took a deep breath and told myself, “You have ten miles to go. All you have to do is put one foot in front of the other. One step at a time.” Left foot. Right foot. Left foot. Right foot. The best I could do was move in slow motion, much slower than my usual pace, even on the gently rolling Tonto Trail. Halfway to Indian Garden, my friend waited for me and asked if I was okay. I could no longer pretend and said, “I don’t think so.” She found a spot with a bit of shade, suggested I sit down, and offered me more of her salty peanut mix. After a brief rest we started toward the green oasis of Indian Garden. When we arrived, I felt enormous relief, and at the same time, trepidation. We still had more than four miles, all up, to hike. As I poured cooling water over my head and clothing, she pointed out the thermometer on the side of the shelter, which registered 90 degrees in the shade! I had already drunk the four liters of water I’d been carrying. Now I would have to drink water without electrolytes. As I filled the bladder of my pack, I pushed away my worries and focused on hiking up the steep trail. Left foot. Right foot. At the next rest stop, I met up with my friend, who was talking with a hiker. He offered me electrolyte candy and a packet of electrolytes, which he suggested I put in my backpack bladder. Until that moment, worries about failing, disappointing my friend, and loss of control had almost overwhelmed me, but, with my friend’s support, the man’s electrolytes, and hikers I met on the trail who spontaneously offered encouragement, I began to feel more like myself. 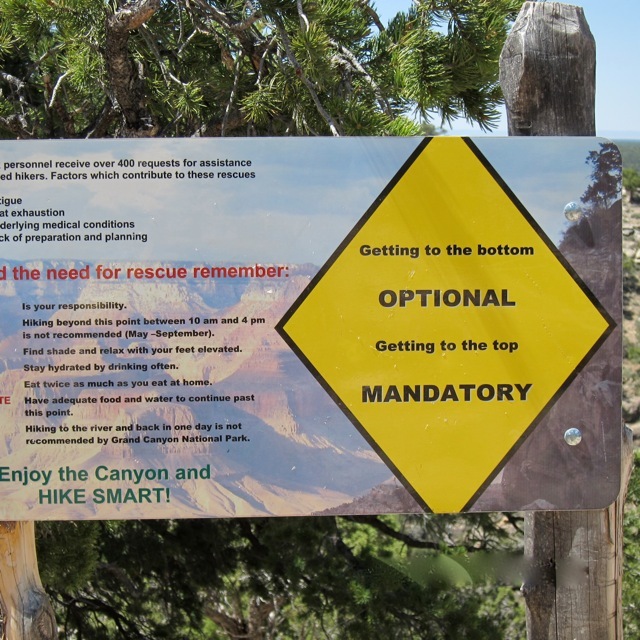 I started to recover my energy and managed to hike up the Bright Angel trail, slowly and steadily until I reached the top. Filled with excitement and euphoria, my friend and I celebrated—treating ourselves to delicious ice cream, which we ate while enjoying glorious views of the Canyon. Some days later, another friend and I were walking in the woods, with me in front. Suddenly I gasped, leapt back, and stared in terror at the long Western Diamondback Rattlesnake stretched out along the path in front of us. To avoid upsetting the snake, we took a huge detour around it. Snakes are thought to be a sign of transmutation—they shed their skins yet remain the same creatures. I wondered if seeing the snake was an omen. The hike in the Canyon, where I found inner strength I didn’t know I had, and then encountering the snake, had a powerful effect on me. I was determined to use these experiences to help me overcome my habitual fear of confronting an emotional bully. I recognized that it was no longer about him. It was about me having the courage to keep centered as I moved on my path, even when the going was rough and the metaphorical boulders blocking my way seemed too huge to move past. I knew that it was time to find the courage to say what I felt, what I thought, what I wanted, when I was in his presence. 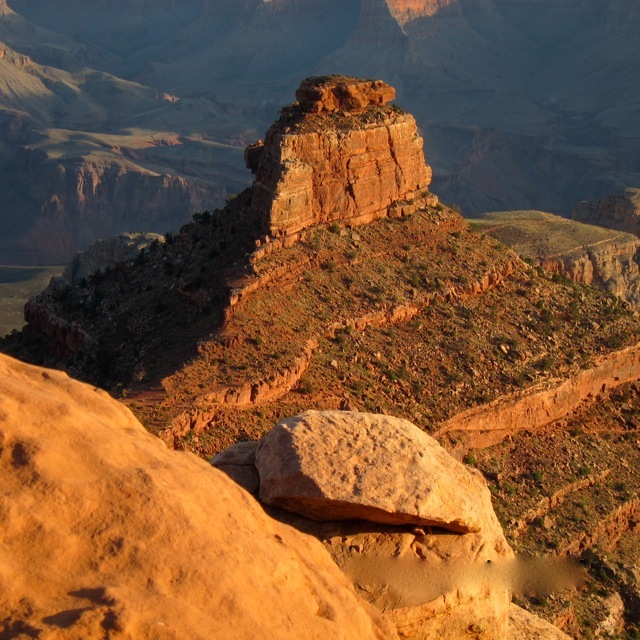 The following day, just as it did on the Kaibab Trail, something happened. This time, when I spoke to myself, it was no longer with my old voice. My Canyon voice had meshed with the message of the rattlesnake: “You can reclaim your power. You can shed the skin that keeps you emotionally imprisoned." Our next phone conversation was difficult. I asked him to please stop interrupting me. When he continued to do so, and accused me of yelling, even though I was purposefully keeping my voice steady, I hung up. The conversation did not go as well as I had hoped, but at least I felt I had stood my ground. After subsequent interactions, we decided to meet in two months. I have promised myself that when we do, I will have the emotional courage to be who I am, to confront my terror of being fully present in the face of his bullying anger. I refuse to shrink, back down, or fall off the trail. Having the courage to respond in the moment is the issue. I am choosing to walk on a new path, where I have never been, with no map or assurance that I know the way. What I have is my Grand Canyon experience and the unexpected appearance of the rattlesnake. Nancy King's most recent books are three novels: A Woman Walking, Morning Light*, The Stones Speak*, and a nonfiction book, Dancing With Wonder: Self-Discovery Through Stories. You can read excerpts of her books, as well as order them, on her website www.nancykingstories.com.